Choosing your Nordic style is like buying a car. You may think you know what you want but you should test a few before you lay out the cash. Nordic skiing includes all free-heel skiing sports, including classical and skating cross-country, touring and telemark skiing. Cross-country skiing appeals mainly to endurance athletes. (Don’t confuse endurance with extreme, even running a few miles a week is an endurance exercise.) Touring attracts nature aficionados, people who love to backpack in the summer and just can’t stay indoors all winter. Telemarking draws alpine descent lovers who hate to stand in line and love untracked powder lines. The narrow design of cross-country skis limits their best performance to groomed trails, but keeps the skis light for speed and distance. Skate skiers love the speeds at which their bodies perform and the alliance of their upper and lower bodies in a rhythmic sprint. Generally, skate skiers stick to groomed trail systems and choose 3-5k loops over 10-20k trails. Inline skaters often prefer this style to classical. Clad in aerodynamic fabrics without packs to weight them down, skate athletes focus on mileage and speed rather than time, scenery or vertical. 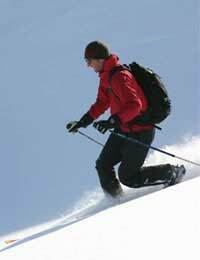 Classical skiers tend to enjoy long treks at relatively lower speeds on flattish terrain. The side groves in a groomed trail focus a skier’s momentum conserving energy for 10-20k trails. Exploring the furthest point of the trail system and enjoying the views along the classical tracks without the weight of a pack entices these athletes. Scenery is more important than vertical, and miles more than speed. Ski touring takes skiers beyond the constraints of groomed trails into the backcountry. Wider striding skis with edges allow for more stability and edge control in the varied terrain available to these skiers, as well as better floatation especially with a heavy pack. Touring athletes tend to be interested in exploration, locale goals, scenery and day or over-night trips; exercise is simply an added benefit to these excursion athletes. Telemarking encompasses the distance aspect of touring athletes with the vertical lust of alpine skiers. Harder boots and alpine style skis offer better downhill performance as well as excellent floatation. Lighter packs are preferred for day or afternoon trips; heavier packs when staying in huts and skiing surrounding slopes. Distance, speed and scenery follow terrain and vertical on the priority list. Many ski areas, cross-country and alpine, and in-town ski shops offer demo-equipment to rent. Short lessons will help you get a feel for each sport with a taste of success. For backcountry touring or telemarking guides can be hired to ensure your safe return, at least until you become proficient in wilderness travel and skiing technique. Asking friends to take you out is also a fun way to try each new sport. All Nordic skiers can quench their thirst for competition within their genre worldwide. Fundraising organizations regularly hold multiple kilometer cross-country races open to everyone, and skiing clubs host FIS sanctioned races for national ski association members as well as recreational participants. Distance touring races take competitors to exotic winter wonderlands and obscure isolated locals like the north and south poles. Measured in marathons, races that cover over a hundred miles of tundra exist. Telemark competitions involve more extreme gravity terrain and aerial maneuvers. Much like its alpine counterpart competitors are judged on the difficulty of line, finesse and aerials. Cliff dropping can be mandatory. Whatever your style there is a Nordic sport to fit your life and body. Endurance athletes need not sequester themselves to the treadmill; backpackers can supplement season hemisphere travel with local winter exploration; and telemarkers can break free of lift lines and ticket prices. Try each sport, you may find a reason to go to work on Monday…to earn the cash for four more sets of gear!